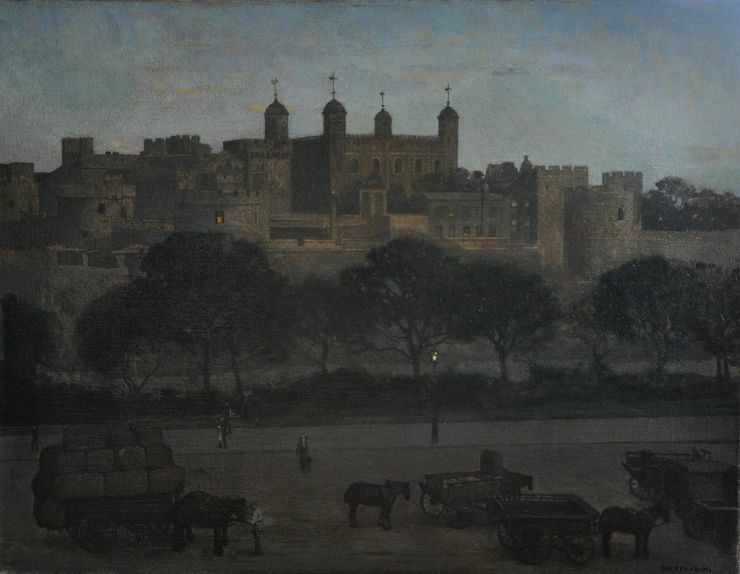 An original oil on canvas by William Dacre Adams, a British listed artist and was painted circa 1920, and depicting the Tower of London at night. A fine nocturne, the glow of the Tower light contrasts with those in the street. Gallery frame 44 inches by 36 inches. Excellent condition. William Dacre Adams (1864-1951). 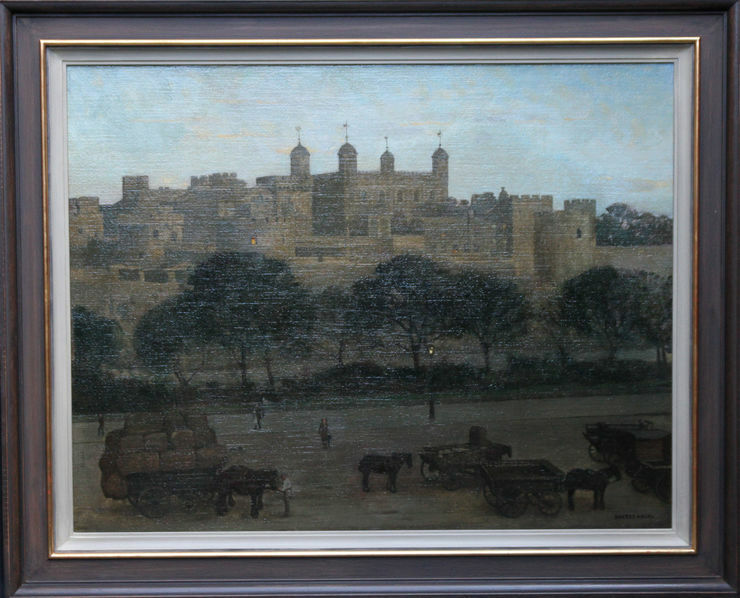 Painter and lithographer of portraits and architectural subjects, Adams was born in Reading. He was educated at Radley College and Exeter College, Oxford. He studied law in Birmingham, but in 1884 abandoned his studies to train at the Birmingham School of Art. He subsequently (1886-90) studied at Sir Hubert Herkomers Bushey School of Art and in Munich, Germany. Adams was elected a member of the Royal Portrait Society and was Associate Societie Nationale de Beaux Arts. He showed extensively at the Fine Art Society (three one-man shows during the 1920s), the Royal Academy, the Royal Institute and Leicester Galleries. His work was greatly influenced by the Pre-Raphaelites (with whom his father was acquainted from school days). Examples of his work are in the collections of The Walker Art Gallery, Liverpool; Worcester College, Oxford; Museum of Fine Art, San Francisco and Wellington Art Gallery, New Zealand. Adams Lived for a time at Lechdale, Gloucestershire; London, and finally at Lewes, Sussex.